We’re delighted to invite you, your family, your friends, and your neighbors to our annual fall client appreciation night, the Pumpkin Patch Event. We want to take this time to reconnect with you, make new friends, and celebrate the life you’ve created with your family and community. 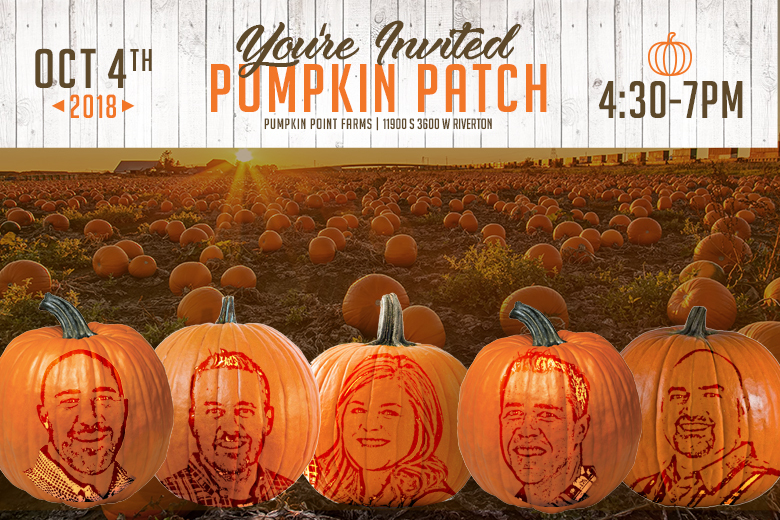 Join us at Pumpkin Point Farms (11946 S 3600 W, Riverton) on Thursday, October 4th from 4:30 to 7 pm. We invite you to pick out a pumpkin to take home, take a hayride around the farm, get professional family photos, get lost in the kid corn maze, enjoy yummy Halloween refreshments, and more. We’re also giving out special treats if you come dressed in costume. We’re co-sponsoring this incredible night with Samantha Poulsen of Academy Mortgage & Adam Ware of Allstate which means more fun and games to thank you for being part of the Big Key Real Estate family. It’s sure to be an evening to remember and we hope you’ll come with your family, friends, and neighbors too!